Rely on the most trusted source in aviation training with ASA’s Prepware software for your FAA Knowledge Exam. More than a “question and answer” recounting of test questions, it combines a powerful software program with the accurate and instructional material you expect from ASA. Prepware gives you the tools and confidence needed to ace the test. 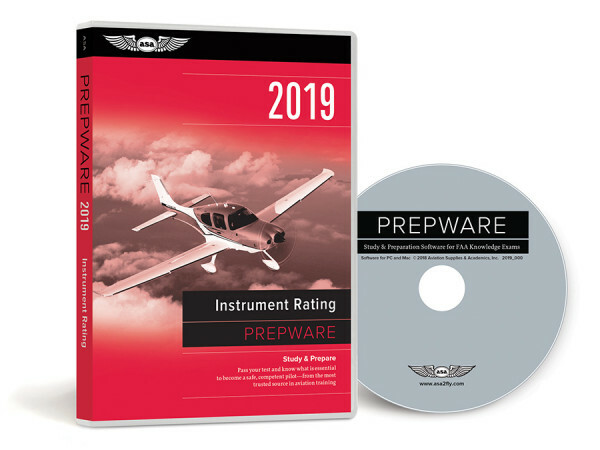 ASA Prepware includes the contents of the Computer Testing Supplement—with the same FAA legends, figures, and full-color charts you’ll be issued at the testing center—to help you become familiar with all available information before you take your official test. You can count on ASA to keep up with changes in the FAA Knowledge Exams with free updates available both online and through an email Update subscription service. ASA’s Instrument Pilot Test Prep is the pilot’s best resource for successful test-taking. Explore Prepware Software by clicking the Try Before You Buy link to the right, and run the Demo FREE of charge.